‘Just because people don’t walk down the street in amazingly unique, totally dysfunctional uncomfortable clothing doesn’t mean it shouldn’t be done’. The above quote is from the wonderfully inventive Donna Demente Ogilvy who made this week’s ‘Wearable’, the fabulous Pallas Athene. Influenced by a mix of classical mythology, mysticism and 17th century alchemy, and named after the Greek goddess of wisdom, courage, just war, art and craft, the piece is reminiscent of body armour with talismanic properties. Donna created Pallas Athene in reaction to the fashion industry’s dehumanisation of models, transforming body parts into personalities. Pallas Athene marked a breakthrough in the public understanding of what ‘wearable art’ really could be. The work won the 1991 WearableArt™ Supreme Award, and retains an ‘iconic’ place in the history of the WearableArt™ Awards. As reviewer Helen Schamroth wrote, ‘it was no real surprise’ that Donna won as ‘Her creation… had a mobile sculptural quality that had little to do with wearable, and much to do with art.’ It was exactly what Suzie Moncrieff, founder of the awards, had been trying to communicate to entrants. Auckland born, Donna Demente-Ogilvy studied art at Elam School of Fine Arts, before moving to the South Island to pursue her artistic career. Specialising in papier-mâché, Donna quickly forged a national reputation for her unique sculptural pieces and theatrical performances. In 1994 she was invited by the World of WearableArt™ to present a theatrical parade at the awards with multiple performers, which was one of the highlights of the show. The following year, Donna moved from Dunedin to Oamaru, where she became actively involved in the town’s Victorian revival, and founded the annual mid-winter masquerade – an event which continues today. Donna’s interest in heritage and theatre made her the obvious choice for a Te Papa commission in 2001. Te Papa invited Donna and her frequent collaborator, Jeff Mitchell, to pay tribute to the tradition of vaudeville theatre – a form of popular entertainment that flourished between the 1880s and 1930s, and which included singers, dancers, comedians, magicians, and circus-style performers (art forms regularly seen in the WearableArt™ Awards today!). In response, the couple made Sandow’s Microvaudevillean Thrillorama! (its about 500mm x 450mm x 750mm in scale). Sandow’s Microvaudevillean Thrillorama!, 2001, by Donna Demente Ogilvy and Jeff Mitchell. Comissioned 2001. © Te Papa. The work is named after Eugen Sandow, an internationally renowned strongman, pioneer body builder, and vaudeville performer. Considered a ‘beau-ideal of athletic elegance’, he was idolised by both men and women, and it’s said that ladies in his audiences sometimes fainted from excitement. The great Sandow toured New Zealand in 1902–3 with Harry Rickards’ Vaudeville Company, creating a sensation with his ‘marvellous exposition of scientific strength and muscular development’. Sandow’s Microvaudevillean Thrillorama! is also a beautifully rendered homage to the golden age of theatre construction in New Zealand between 1890 and 1930. 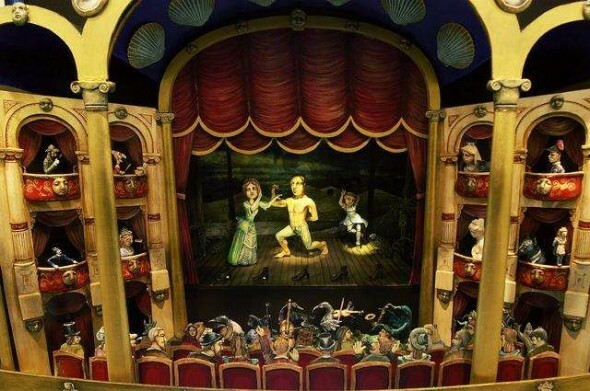 Donna and Jeff’s miniature theatre drew inspiration from both His Majesty’s Theatre in Wellington (now the St James) and The Opera House in Oamaru. The great Sandow struts his stuff on Donna Demente-Ogilvy and Jeff Mitchell’s miniature stage. Detail of Sandow’s Microvaudevillean Thrillorama!, 2001 © Te Papa. 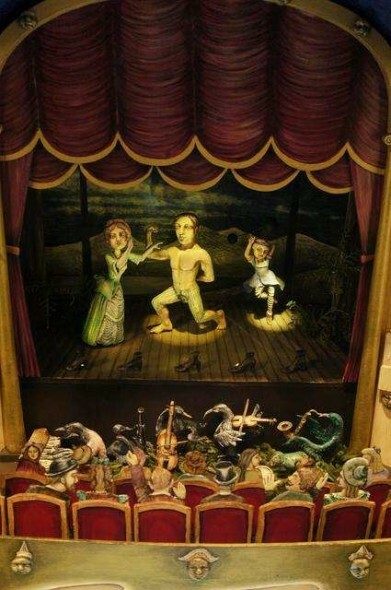 Sadly, the orchestra hints at the fate of not only vaudeville, but of many of New Zealand’s beautiful Victorian theatres – if you look closely, you’ll see that the musicians are extinct or threatened native birds. Thankfully, both the St James and Oamaru Opera House are still in use, and thankfully organisations like the World of WearableArt™ still strive to create magical, theatrical experiences for live audiences. Detail of Sandow’s Microvaudevillean Thrillorama!, 2001. © Te Papa. ‘Wearable of the Week’ is posted in conjunction with The WOW Factor: 25 Years in the Making, which is on display at Te Papa until 17 August 2014. For more on the World of WearableArt™ visit WOW® online.